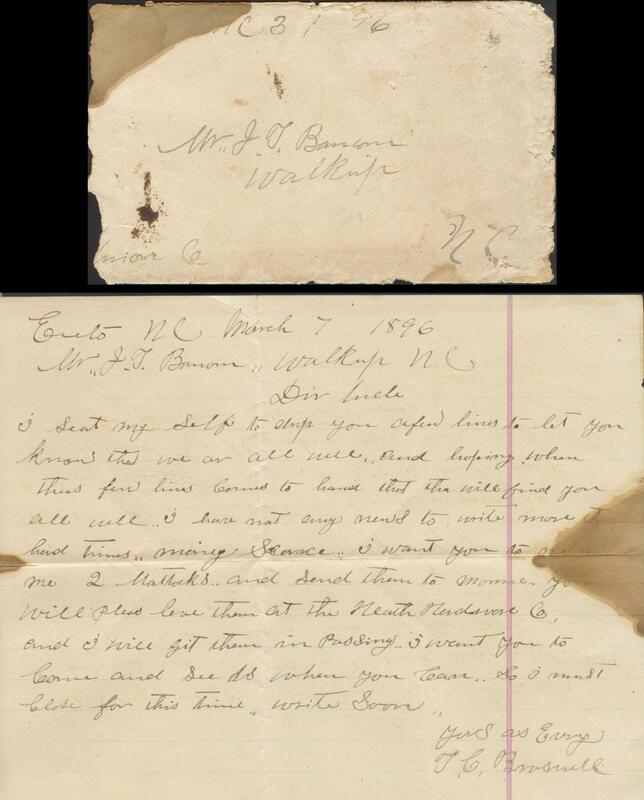 Old Documents from Union Co, N.C.
Letter (partial) from D.A. 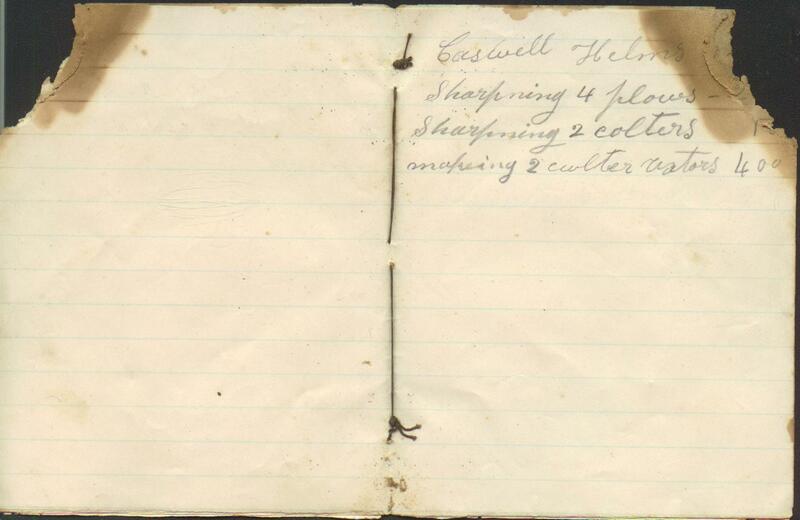 COVINGTON and H.B. 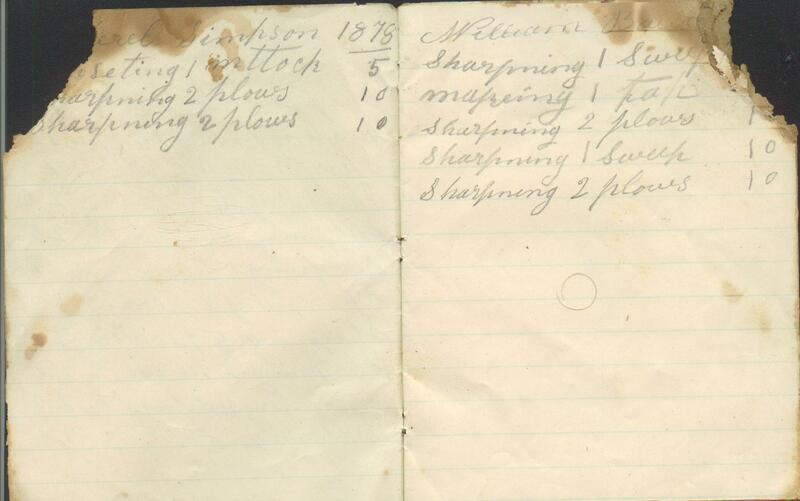 ADAMS, Attorneys, 1886. 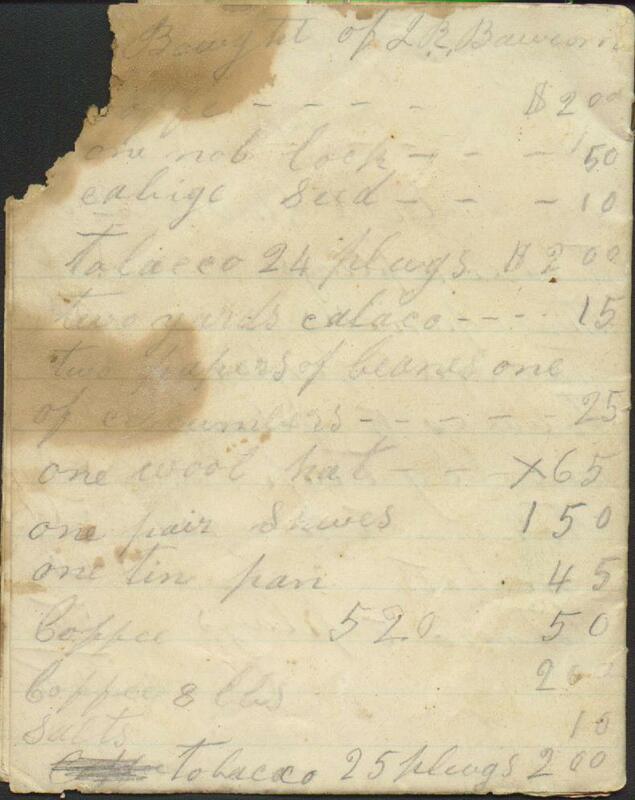 Illustrated Envelope from THE WADE-KING MERCANTILE COMPANY, Waxhaw, N.C., dated 1900. 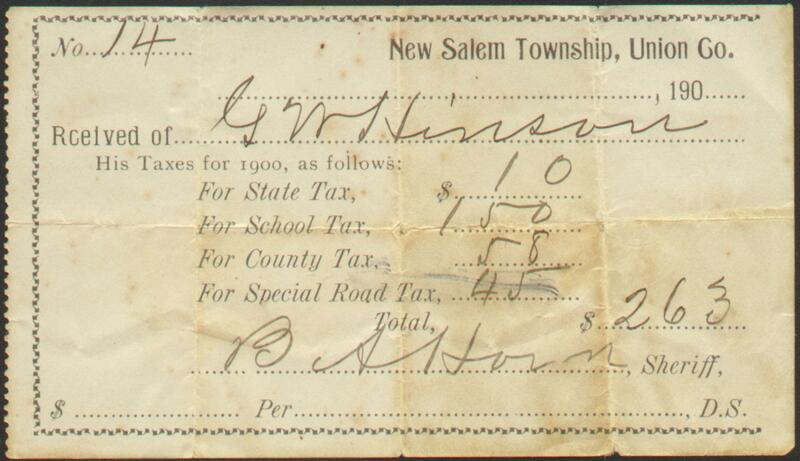 Tax receipt for G. W. HINSON, New Salem Township, dated 1900, signed by B. A. HORN, Sheriff. 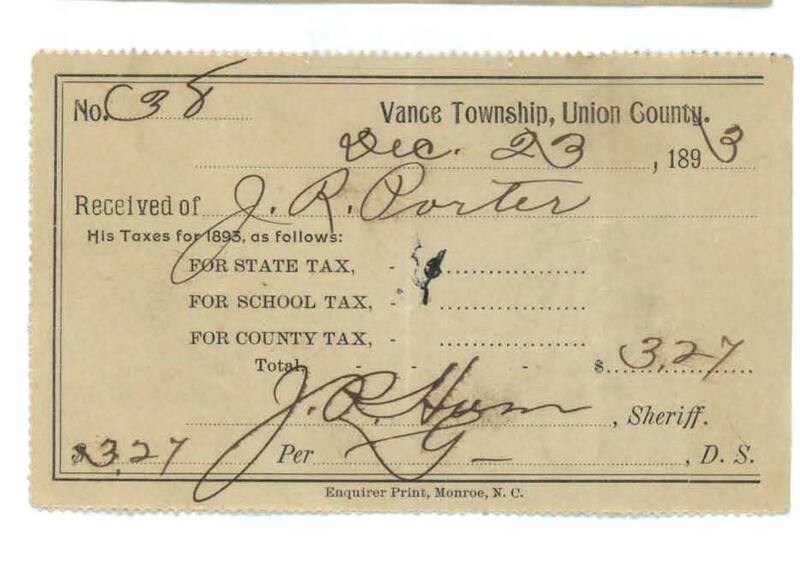 Tax receipts for James R. Porter, Vance Township, dated 1885, 1887, and 1893, signed by J. P. HORN, Sheriff. 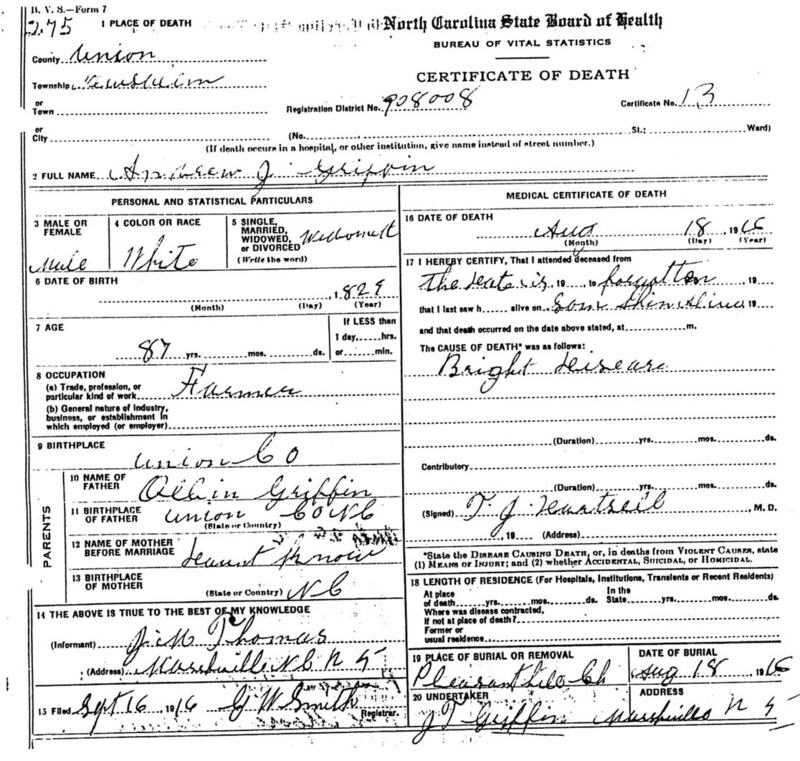 Documents of Joseph T. Baucom, son of Joseph Thomas Baucom and Sarah W. Brantley, and grandson of Lewis Baucom and Lucy Ellington. I’m only distantly related to these folks by marriage. I found these items at an antique store. 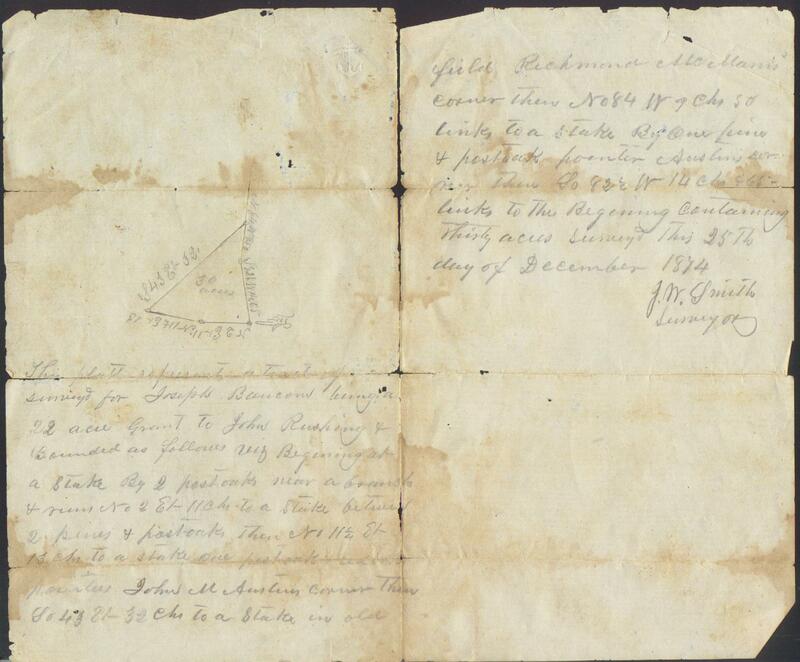 Land survey dated Dec. 25, 1874 for land of Joseph BAUCOM signed by J. W. SMITH, Surveyor. 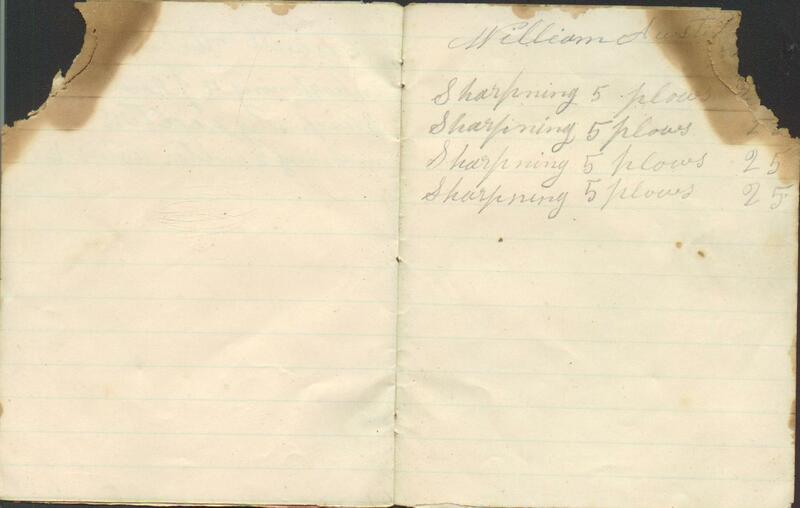 Mentions land of John RUSHING, John M. AUSTIN and Richmond McMANUS. 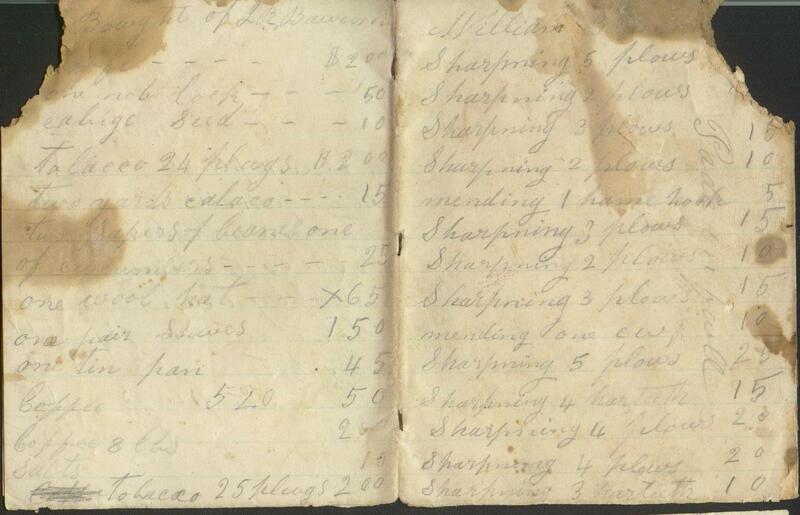 Homemade booklet from about 1878 listing accounts, mostly for sharpening plows and items bought of J.R. BAUCOM. 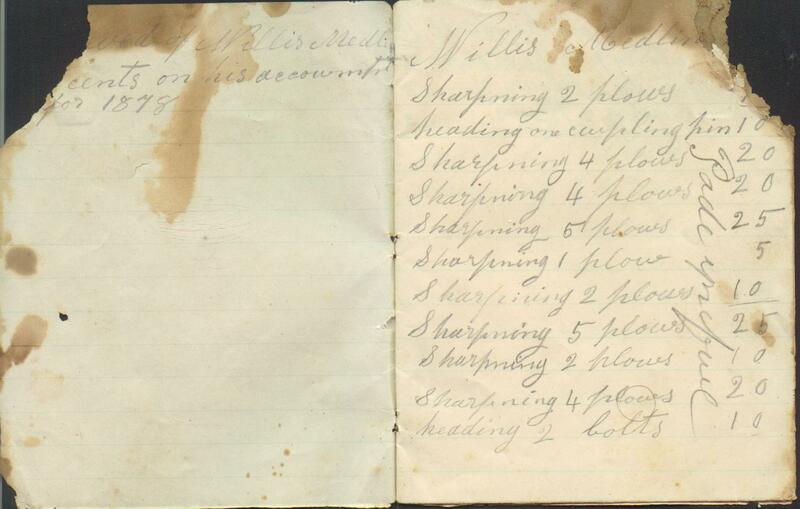 Page 1- William BAUCOM, pages 2-3-Willis MEDLIN, pages 4-5---erel SIMPSON and Caswell HELMS, page 9-Caswell HELMS, page 11-William AUSTIN, pages 14-15-J. R. BAUCOM, page 16-J. R. BAUCOM. 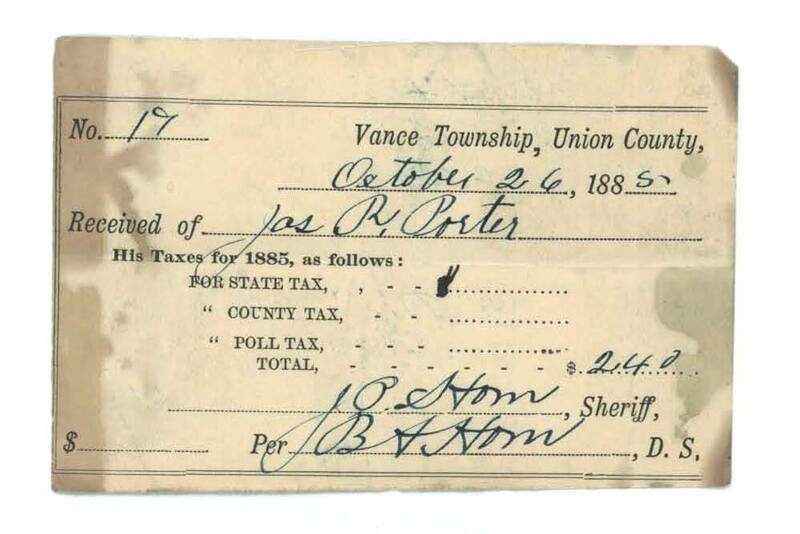 Receipt of J. T. BAUCOM signed by John D. STEWART, dated April 5, 1879. 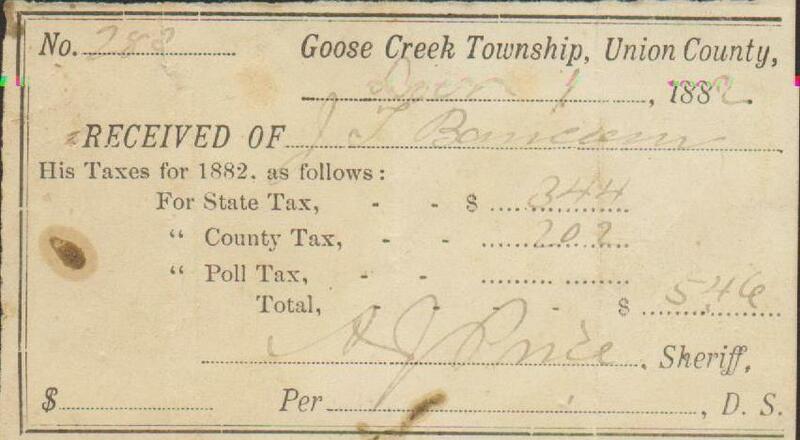 Tax Receipt for J. T. BAUCOM, Goose Creek Township, 1880, signed by Sheriff J. J. HASTY. 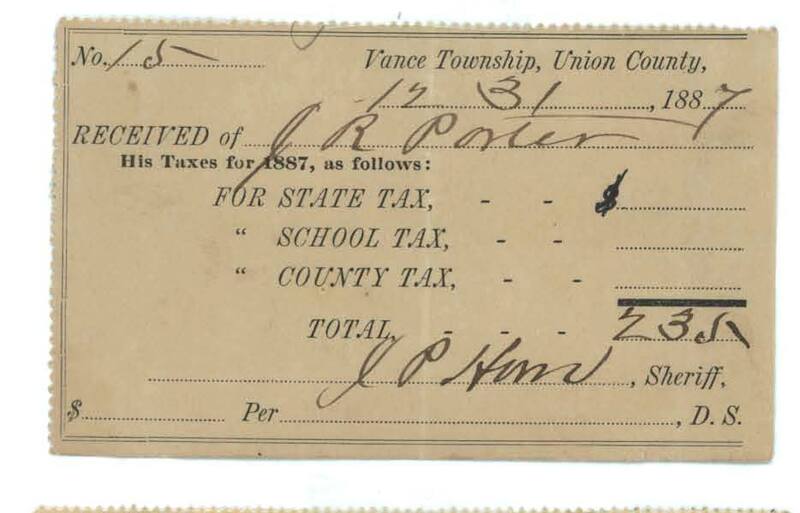 Tax Receipt for J. T. BAUCOM, Goose Creek Township, 1882, signed by Sheriff A. J. PRICE. 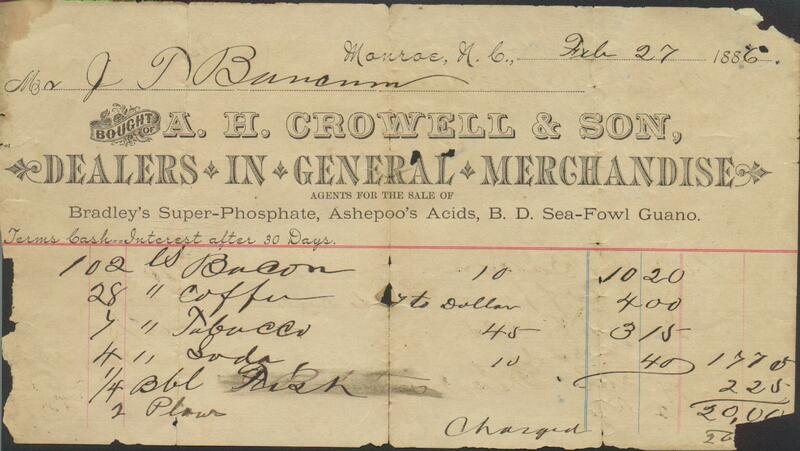 Receipt of J. T. BAUCOM signed A. H. CROWELL dated Oct. 19, 1885, Monroe, N.C.
Billhead of A. H. CROWELL & Son, Dealers in General Merchandise, made out to Mr. J. T. BAUCOM, dated Feb. 27, 1886, Monroe, N.C. 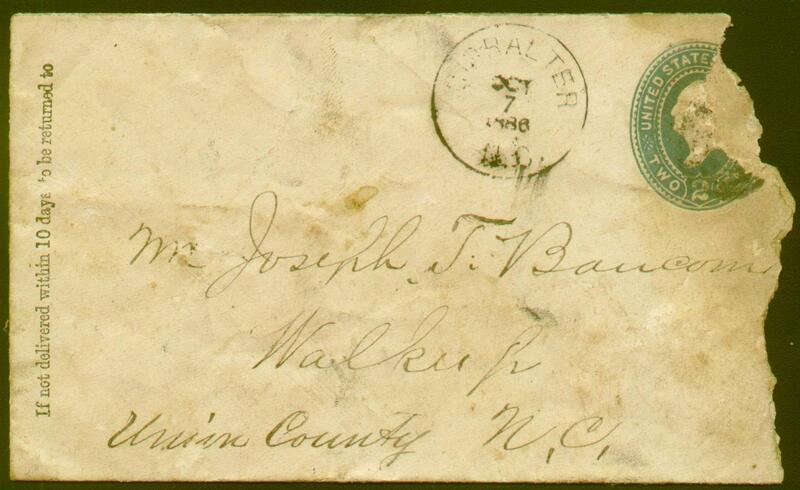 Envelope addressed to Mr. Joseph T. BAUCOM, Walkup, Union Co., NC postmarked Oct. 7, 1886. 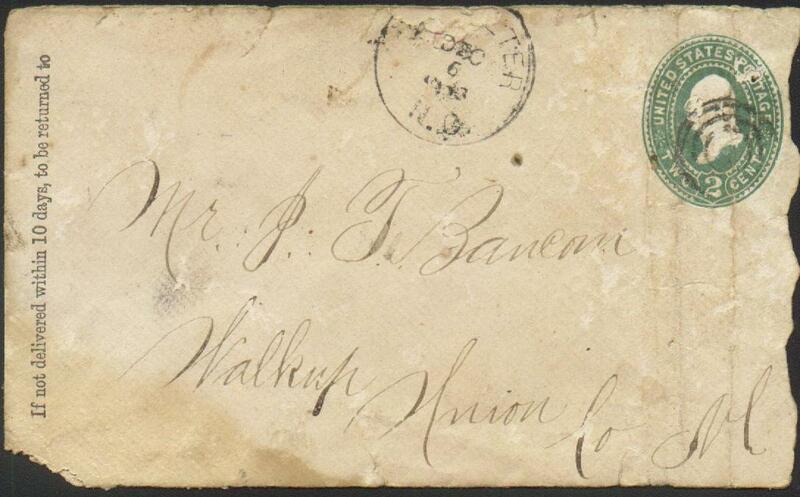 Envelope addressed to J. T. BAUCOM, Walkup, Union Co., NC postmarked Nov. 14, 1889. 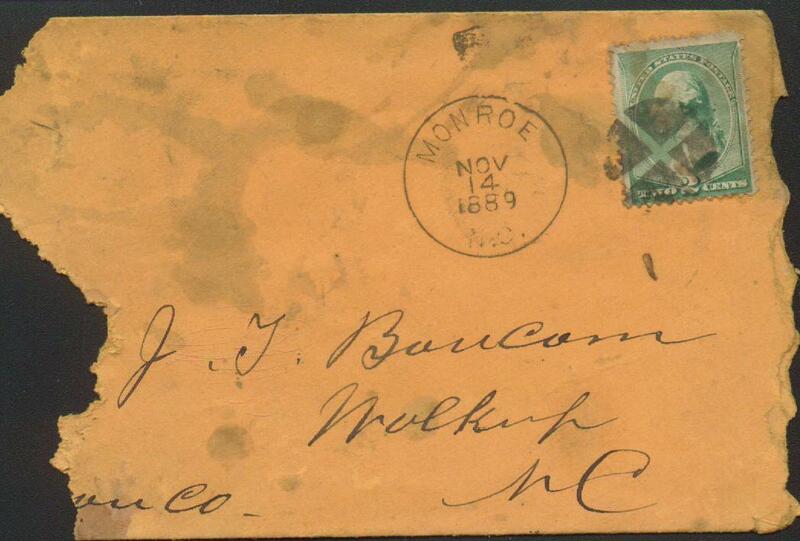 Envelope addressed to Mr. J. T. BAUCOM, Walkup, Union Co., NC c.1890s. 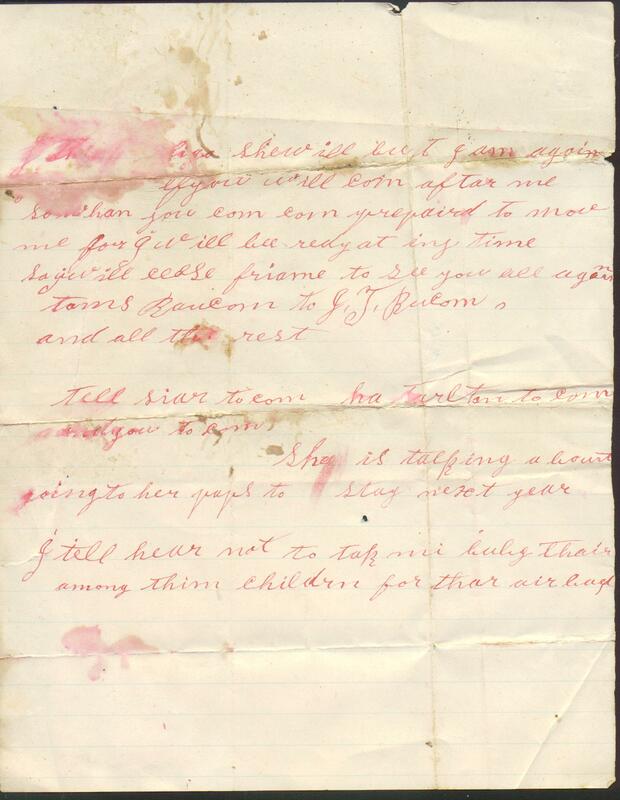 Letter from L.D.H. 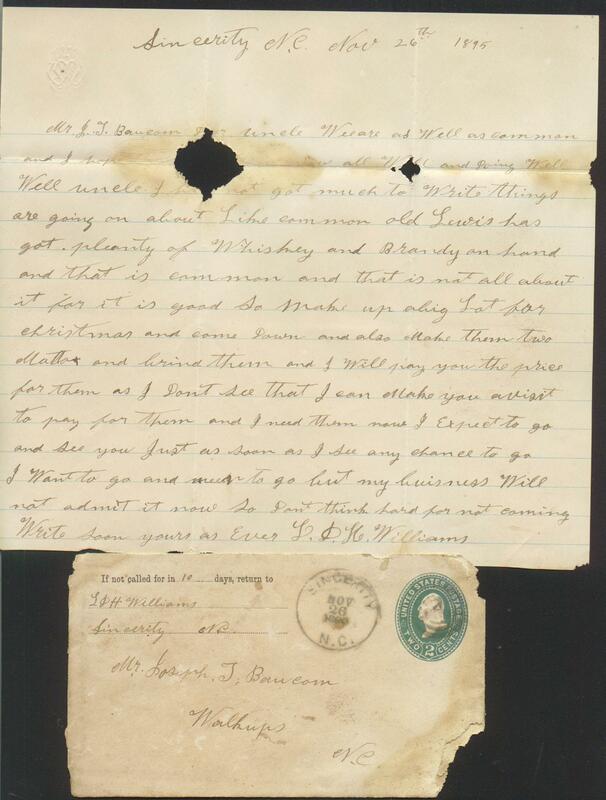 WILLIAMS of Sincerity, N.C., to “uncle” Mr. Joseph T. BAUCOM, Walkup, N.C., postmarked 1896. 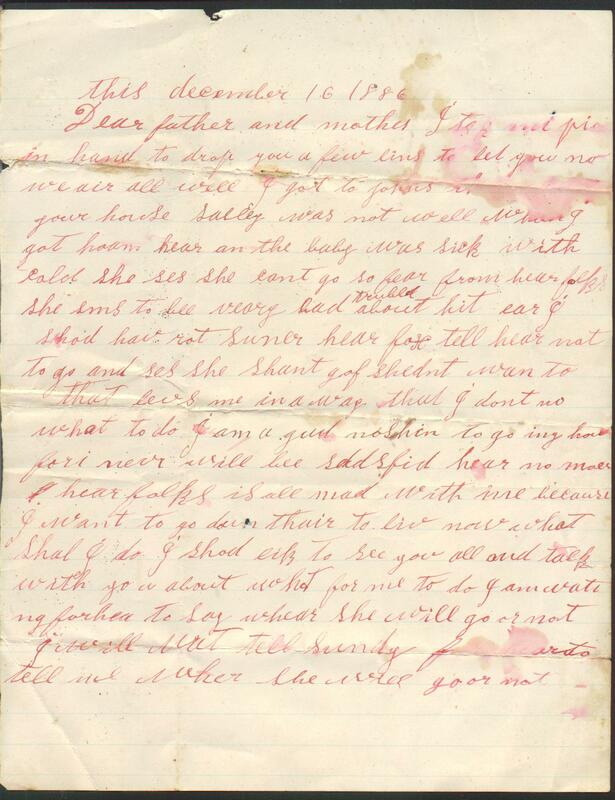 Letter from T. C. BRASWELL of Euto, N.C., to “uncle” Mr. J. T. BAUCOM, Walkup, N.C., dated March 7, 1896. 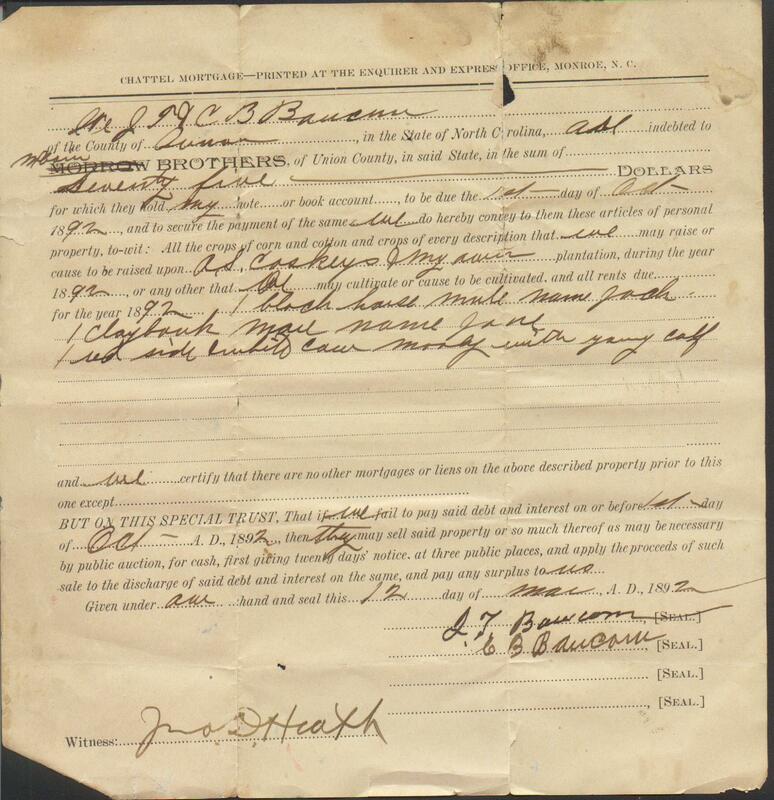 Documents of Eli P. Tarlton, brother in law of the above Joseph T. Baucom. 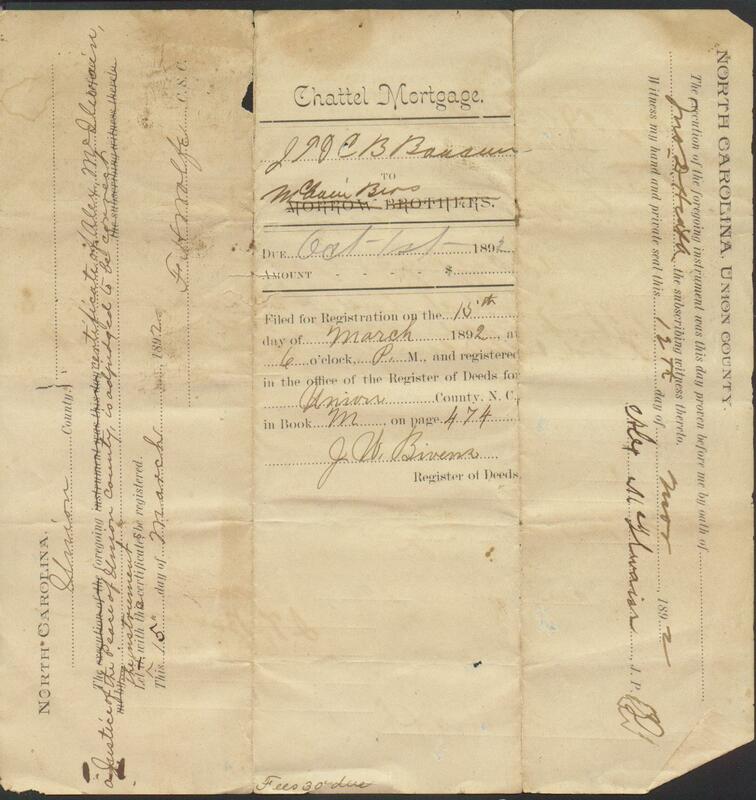 He married Sarah E. Baucom, daughter of Joseph Thomas Baucom and Sarah W. Brantley. Postcard addressed to Eli TARLTON, Waxhaw, N.C. dated not shown. Advertisement for English Drug Store, Monroe, N.C. 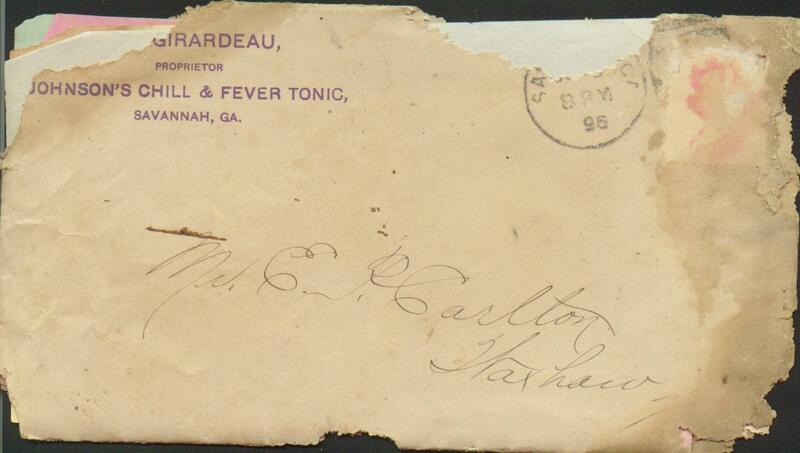 Envelope addressed to Mr. Eli P. TARLTON, Waxhaw, N.C. postmarked March 23, 1895. 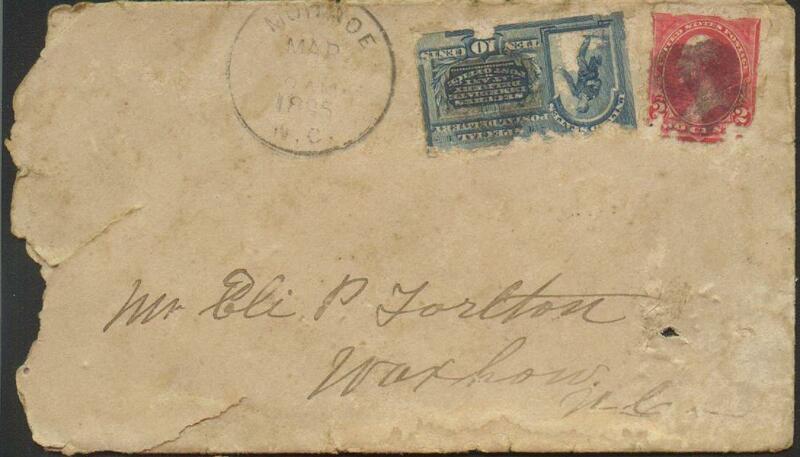 Envelope addressed to Mr. E. P. TARLTON, Waxhaw, N.C. postmarked ‘95. 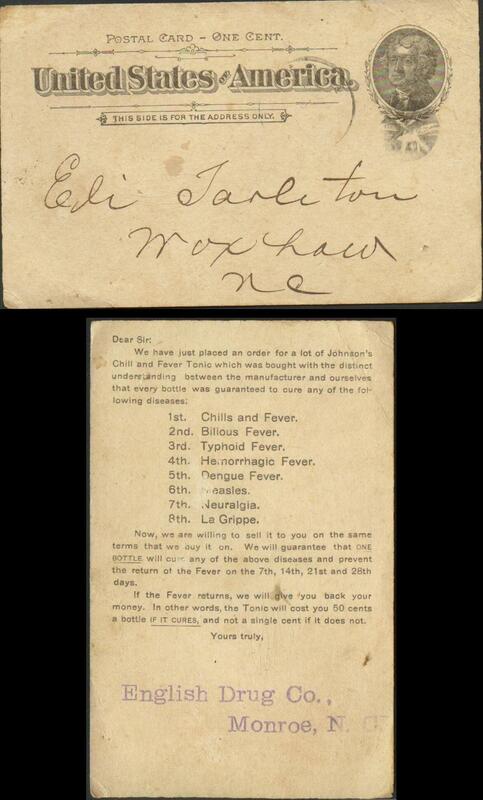 Contents were advertisements for Johnson’s Chill and Fever Tonic. 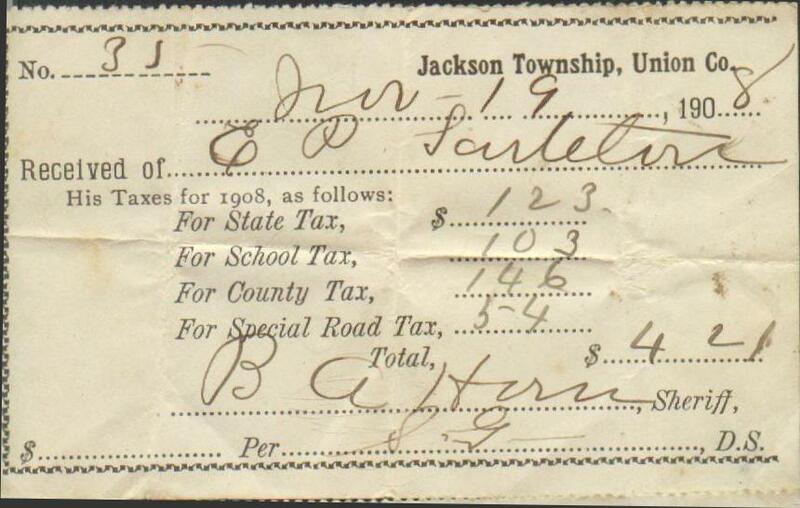 Tax Receipt for E. P. TARLTON, Jackson Township, 1908, signed by Sheriff B.A. HORN. 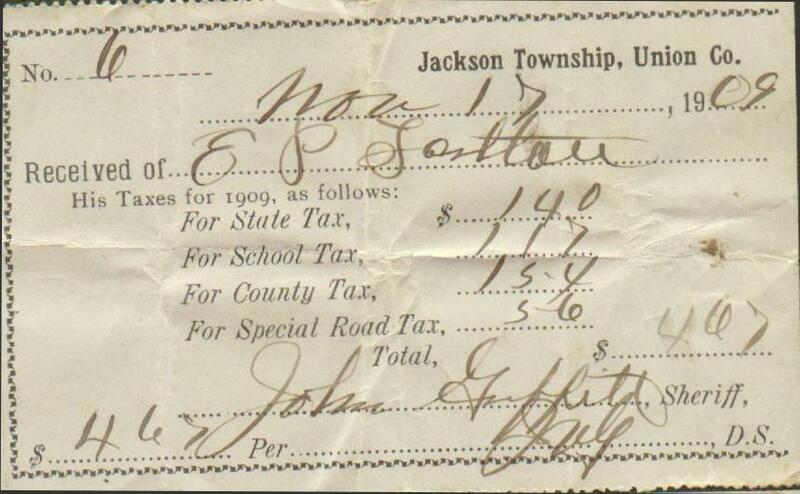 Tax Receipt for E. P. TARLTON, Jackson Township, 1909, signed by Sheriff John GRIFFITH. 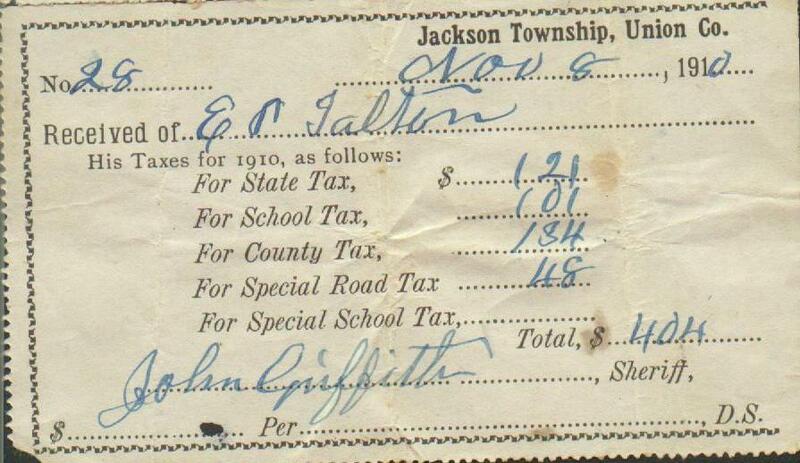 Tax Receipt for E. P. TARLTON, Jackson Township, 1910, signed by Sheriff John GRIFFITH. 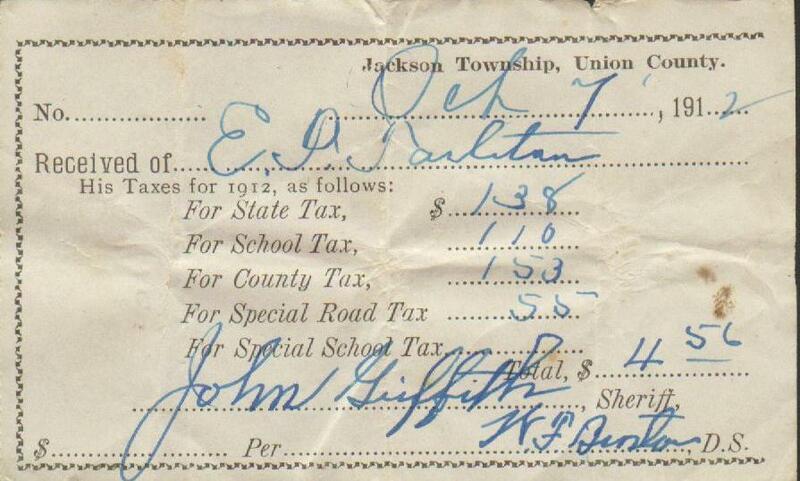 Tax Receipt for E. P. TARLTON, Jackson Township, 1912, signed by Sheriff John GRIFFITH. 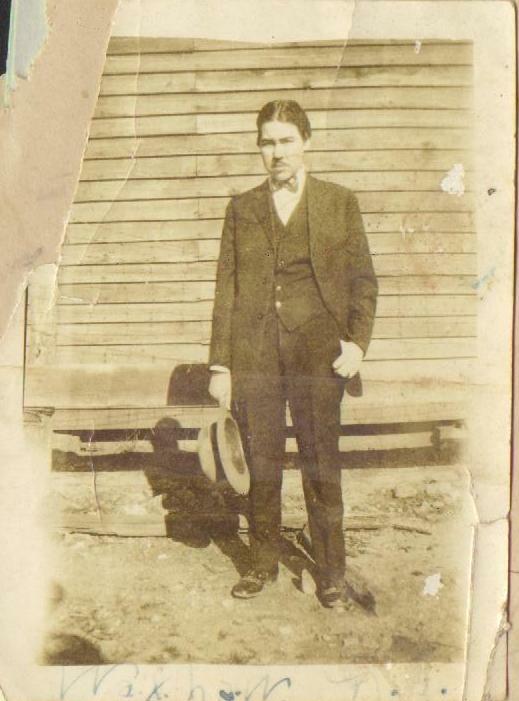 Unidentified photograph of young man with moustache, c.1920-1930’s. 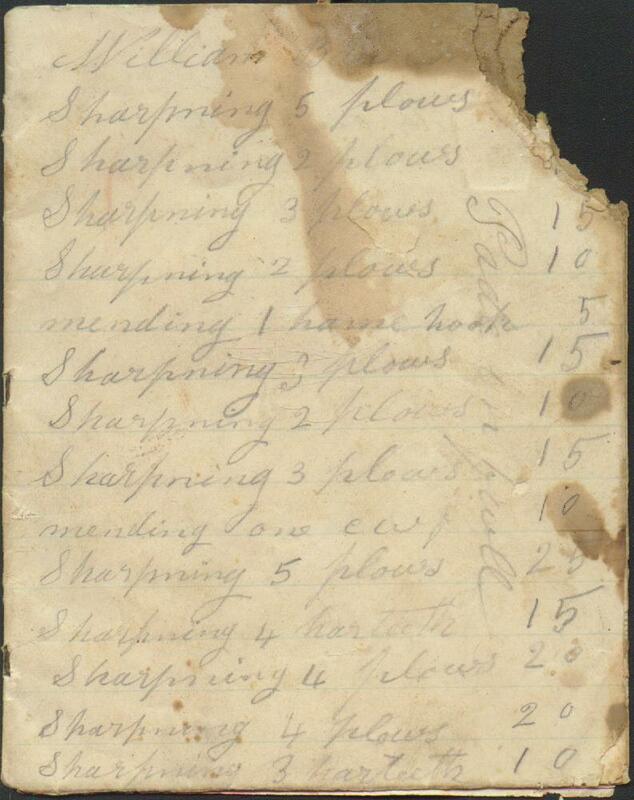 Written on the front is: Waxhaw, N.C.